Wrigley Roster Jenga: Check Out That Backside! ... awwww come on - I didn't mean it like that... get your mind out of the gutter, folks. 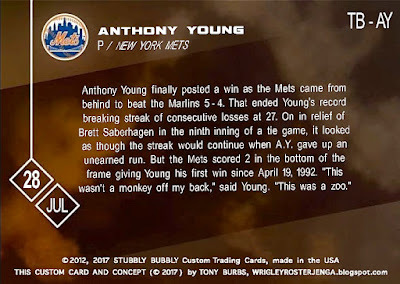 A few days ago, I posted my tribute to former Mets and Cubs pitcher Anthony Young, who recently passed away as the result of a brain tumor at the far too young ago of 51. 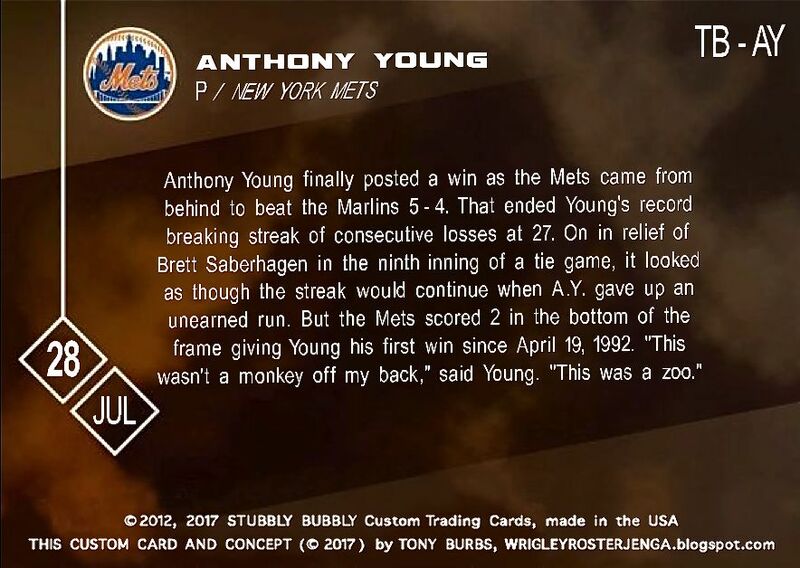 That tribute, if you didn't catch it, was a Topps "THEN" card (riffing on the print on-demand NOW cards) which commemorated A.Y. breaking his infamous losing streak in 1993, after getting the "L" in 27 straight decisions. Despite being an above average, serviceable pitcher for seven years in the Majors with a pair of big market clubs, that record will always be his legacy. Well, longtime friend of the blogosphere, commenter on this blog since darn near day one, and noted Metropolitans fanatic, Stubby, saw this tribute to his a man he referred to as a "mensch." He noticed that it was missing a certain something and stepped in to complete the "card:"
What's a baseball card without a good backside? We definitely needed a little bit of exposition on a card which celebrated a specific moment, as well. 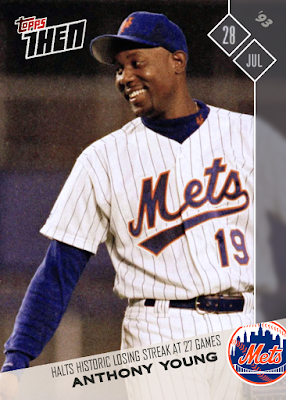 I'd say that, while I don't actually have a 2017 NOW card to physically compare it to, Stubby nailed the design and text, from what I've seen on the scans. I know the font was giving me fits on the picture-dominated front of the card; so, I can only imagine what it was like trying to mimic that paragraph format. This is certainly top notch work! 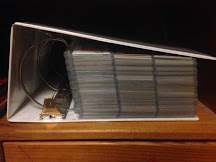 Stubby has made waves and waves all over the internet with his custom cards (several of which even reside in my CATRC binder) and, I have to say, I'm quite honored to collaborate with him on this little project. It adds a certain sense of legitimacy to my Photoshop playtime. Plus, I get a real kick out of seeing my name and blog address in the "legalese" at the bottom, right alongside "Stubbly Bubbly Custom Trading Cards." Sometimes, in the wise words of Rob Base and DJ E-Z Rock, "it takes two to make a thing go right, it takes two to make it outta sight." Now that I have a full card mocked up, I just might have to get a few of these printed; after all, it would be a shame to let this hard-worked collaboration to go to waste, right? Stubby, thank you for the assist - we should come together again sometime! Very cool idea, and excellent execution. Eesh. Sorry, Brett. I get my creative spurts at like 4 in the morning. Stubbly Bubbly could definitely use a proofreader.